Optical measuring and inspection techniques have been used in the science and industry industries since the early 1900s. Optical comparators are a form of inspection machine that project magnified images of parts onto a glass screen via mirrors, lenses, and illumination sources. If you need to take 2D measurements, using optical comparator and vision systems is the way to go. 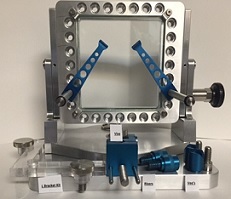 If you are looking for a universal fixture for optical comparator & vision systems, look no further than Willrich Precision. You can be sure that we are the go-to shop for stellar quality universal fixtures for optical comparator & vision systems, which offer all the advanced features you are looking for. Willrich Precision has been in the business for more than four decades, and our clients from the gaging, inspection, and metrology industry have benefited from our unerring commitment to affordable precision measurement instruments, good quality and a helpful and knowledgeable customer service team. Our customer service representatives have a deep knowledge of optical comparator & vision systems so you can rest assured that you will always buy the right product for your applications. Start shopping with us now!